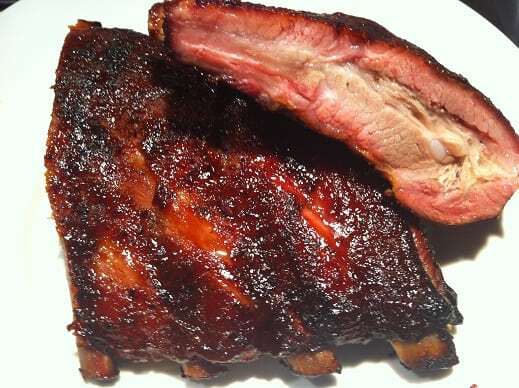 I have tried two approaches to cooking ribs on the Weber Jumbo Joe and found the best way was to cut the rack in half and slow cook them directly on the grate. 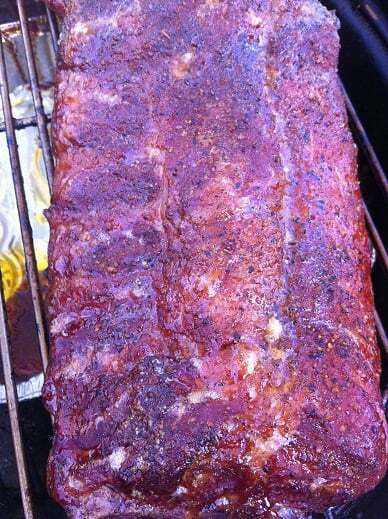 My first attempt with ribs used a rib rack. 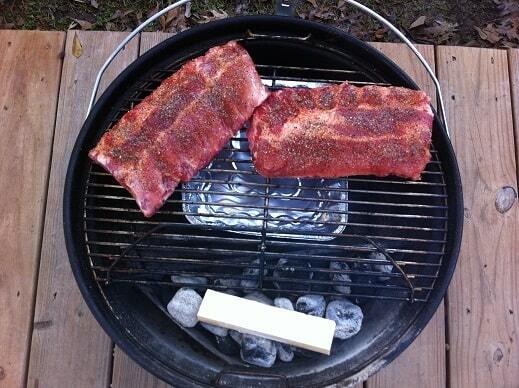 In order to use a rib rack you need to remove the grilling grate and place the rack on the charcoal grate. 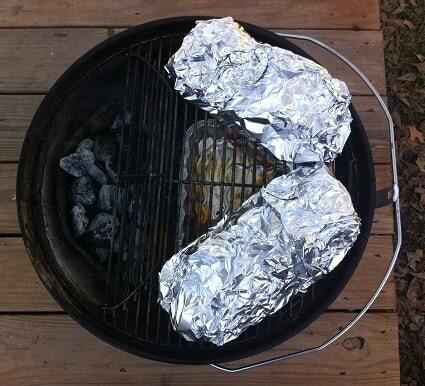 This setup is pretty similar to my first pass attempt at cooking a beer can chicken on the Weber Jumbo Joe. 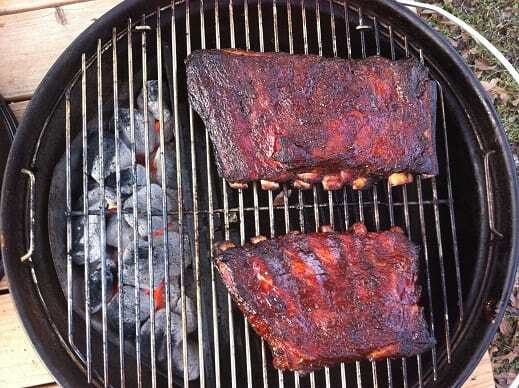 The rib rack approach worked okay but I thought it was a hassle. I ended replacing the grill grate at the very end of the cook so the sauce could set on the ribs. I figured if I am going to have to use the top grate at the end then I should just skip the rib rack and use the top grate the entire time. 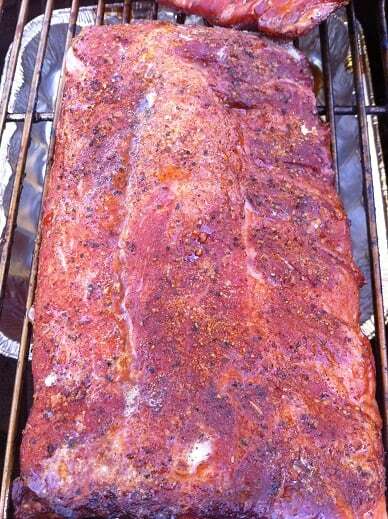 My second attempt used a slab of baby back ribs. There just isn’t a good way of fitting a whole slab of ribs onto an 18 inch grill. I think your best bet is to just cut them in half. 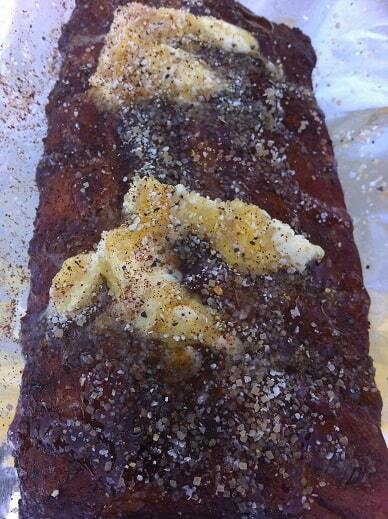 By the way, if you need help figuring out which rib rub to use here are some great ones. The cook was pretty standard. 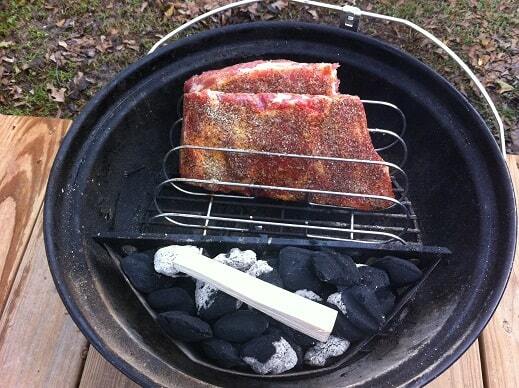 I filled a charcoal basket with unlit Kingsford then placed a few lit briquettes and a split of maple on top. The air vents were set to 50% and a drip pan was placed underneath the grill grate. Here is how they looked at the two hour mark. And here they are at three hours. They got the standard foil treatment of margarine, honey and more rub and were placed back on the Weber Jumbo Joe for an hour and a half. I added a few more unlit briquettes before I closed the lid. An hour and a half later the ribs came out of the foil, got painted with Sweet Baby Ray’s and slow cooked for one more hour. I think they came out looking pretty. I know they tasted great! 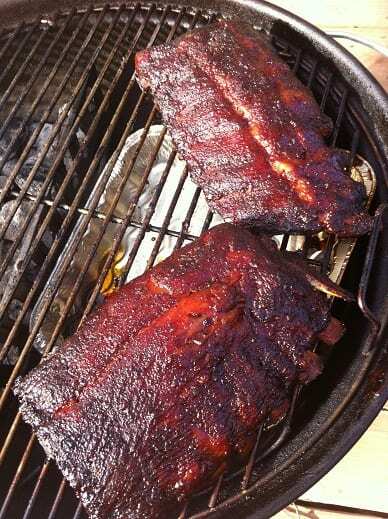 If you buy the hinged grate (or have an extra grate lounging around) you can easily do two racks of ribs at once using the strategy I employed to cook twenty chicken thighs on the Weber Jumbo Joe. If you go this route just make sure to swap the ribs between the two grates every hour to deal with the temperature differential. If you decide the Jumbo Joe would be a good addition to your backyard you can pick one up here at Amazon. I highly recommend eventually getting the hinged grate as well. It comes in handy on long cooks and can be used to drastically increase capacity. Lots of people are concerned about a cover or bag for the Jumbo Joe. Weber told me they come out with new products in November of each year and they may or may not offer a cover for the Jumbo Joe. A simple solution is to buy a the standard Weber cover for any of their 18.5″ grills. The number of the cover I bought was a Weber 7450 cover, an all vinyl inexpensive cover ($6.99). You can do one of two things. Measure about 9 inches up from the bottom of the cover and trim with scissors 9″ off the bottom of the cover. Or what I did was hem the bottom of the cover up about 9″ and secured the hem with good duct tape. You know have a cover that fits the Jumbo Joe like a glove. Just turn the cover inside out, and measure up from the bottom 9″ and make a mark. Do this all around the cover. Connect your marks with your marker or pen. You will now have a line to follow if you want to cut the excess cover off or a line to fold over the bottom of the cover to hem it. All I can say, it worked for me. In November I will see if Weber does come out with a cover for the Jumbo Joe or not, but in the meantime, for $7 what I have will work fine. Tony, thanks for the idea! I had a local shop make a cover for mine but your suggestion sounds easier!